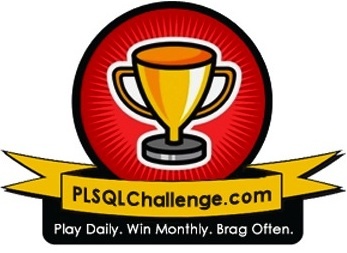 Today I came across a link on how to solve sudoku puzzles using sql. It is written in T-SQL in SQLServer2000, but the code is published, so there is no reason for it NOT to be converted to PL/SQL so that it can be used in an Oracle database too ;-). Steven Feuerstein has release a new version of Qute. This time he has added a raffle when you tell what you like and dislike about the product. I think this means that Qute will become production ready really soon.